Zonalin is a modified accelerated setting zinc oxide eugenol cement which conforms to ISO 3107. 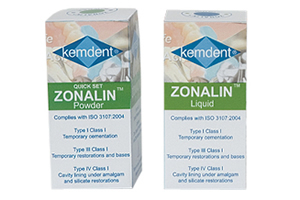 Mix zonalin powder and zonalin liquid together to form an economical temporary restoration, base or cementation of crowns, bridges. onlays, inlays, orthodontic bands and brackets. The mixture is also used for cavity linings under amalgam and silicate restorations, for pulp capping (to protect the pulp from thermal change and acid irritation of cements) and as a temporary seal for medicament dressings. Do not use as a base for composite restorations. Setting Time at 37°C 4 minutes- 10 minutes: Warm conditions decrease and cold conditions increase working and setting times. Store in a cool, dry, place. Replace cap after use.